You should do your preparation! It makes you a better writer!!! It is *just generally* better!!! Preparations work also means the *really* sucky inevitable first draft crap is gone, because the writer has excised it as s/he works out what will happen already. That makes a reader’s life a WHOLE lot easier. CLICK HERE for this post as an infographic! What preparation work should writers do? But what is the difference between an outline and a treatment? What about Beat Sheets? Scriptments?? ?There’s such a vast array of names out there, it’s no wonder writers are confused as to what agents,m producers and publishers are asking for. NEW! Watch The Video Version Of This Post!! I think of outlines as writer-only material. It’s the document in which YOU work out your storyline, though you can share it with script readers and editors, obciously. Five or six pages should do it for a feature; less for smaller scripts obviously. Since it’s all about story, I don’t think you have to stress too much about character in an outline; it’s all about making sure the story is coherent and in the right order. I recommend to Bang2writers generally that they write an outline in the style of a short story, even starting “Once upon a time…” if that helps (and it does some people). However I’ve seen outlines written as bullet points, mind maps and all sorts! As long as it makes sense to YOU and in turn means a coherent script will come out of it, who cares what it looks like? 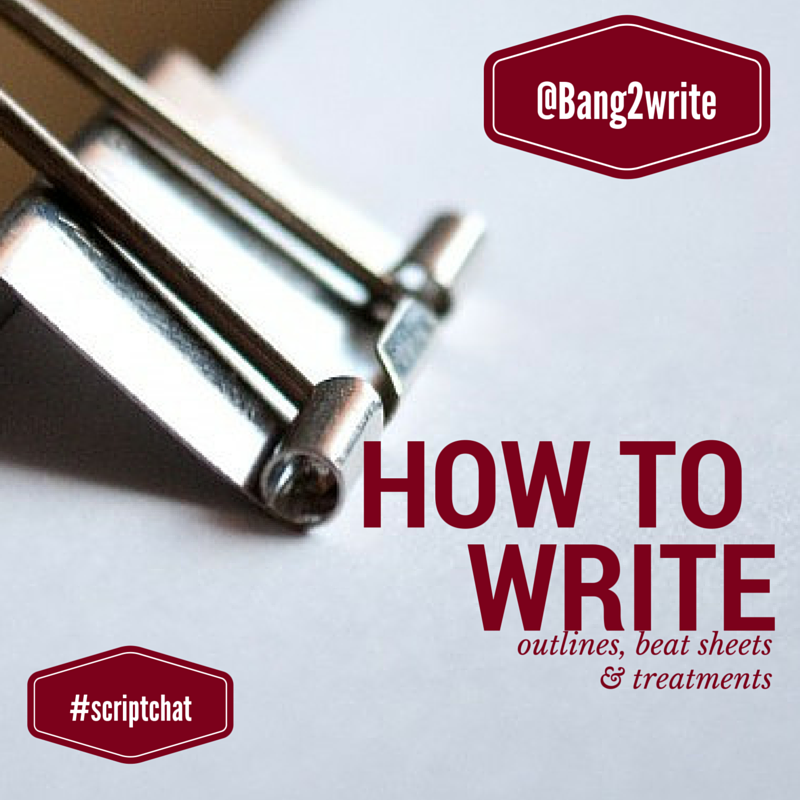 Better to start with an outline that looks like hell than write a script with no outline at all! TIP: If you cannot finish your outline or have a problem with something in it, it’s wiser to work on it THEN than just gloss over it and go to script regardless. (aka “scene breakdowns”; aka “step sheet”, ‘story map’ or similar). I think of a beat sheet as a list of everything that will happen, in order, throughout your screenplay or novel. That’s right – you can use them in novels too if you like. I have used them in every novel I have written (to both stay ‘on track’ and also find out where I need to rewrite after the first draft). I think Beat Sheets are brilliant because it’s a way of diagnosing “flabby bits” in your writing or seeing in advance that one scene or set up is better placed somewhere else in order to pay off later. They are however incredibly dull to write AND read. But they really are worth doing. You just have to grit your teeth and get on with it. If you work in TV, especially soap, there’s a good chance you will be expected to submit a scene breakdown to your script editor for approval before going to script. If you go on a long screenplay course like a degree or mentorship, you may be asked for these too. The key to remember with treatments: this will become your SELLING document. You’ll probably end up writing this AFTER the screenplay, rather than before it. This is why the treatment must be uber-polished and must totally rock. A good treatment is not only about hooking the reader in, but remembering it’s about STORY. You can do this any way you like. I think the short story idea is a “goody” again here because it’s a simple format that is hard to screw up: if you use something like Grimm’s fairy tales as your template, you have an automatic Three Act Structure to give you a hand. However, I have seen treatments that divide up Acts that have worked well. Sometimes a well-thought-out accompaniment helps, like a photograph of the lost place, character or pet which is the focus of the piece. When these fancy ideas work well, they can be brilliant. But beware of covering up a poorly conceived story with fancy artwork. The treatments I read are so often just a series of visuals and this means I haven’t got a clue what is going on in terms of plot, story or theme. Make every action of your characters’ journey obvious, it’s like scene description; don’t think about the LOOK of the scene, but how your STORY fits together. Character is often undersold in the treatment too, which is why I’m a big fan of what people sometimes call the “scriptment”: these are treatments with dialogue in, something I’ve only seen spring up in the last two years or so. But make sure you don’t go OVERBOARD with the dialogue! Using a little to characterise certain people can work work wonders … But use too much and the reader wonders why you bothered submitting a treatment, why not the actual script? Also called “Extended Pitches”, these documents usually run 3-4 pages. They’re essentially abridged treatments and have come into favour in the last 2-3 years, especially by agents and investors who don’t have time to read the whole screenplay. They have to REALLY GRAB the reader, they can’t be dull. Writing a good sizzler is incredibly hard but works dividends for the writer, especially in terms of getting meetings. To read more about Sizzlers, CLICK HERE. Scriptments…blimey! What will they think of next. “lovely peeps at SimplyScripts” That is so kind of you. Top stuff yet again, Lovely Lucy! Hmm, yes an outline is probably essential when writing a screenplay. I definitely could of saved much time and effort, if I’d done so. But it’s all about learning the hard way (for me anyway) and putting the time in. I think once you have a framework, which is essentially what we’re talking about, then the subconscious creativity can take the reins within these parameters. Great reference post Lucy, cheers. No probs, glad it’s useful Tom. Googled the following words “screenwriting beat sheet step outline” and your post/blog came out on top. Bravo! You’re in the big leagues, girl. Keep at it!